"He was a New York City cop when he won five games in 1990. Today he's still a New York City cop and is completing a doctorate at the John Jay College of Criminal Justice. Please welcome..."
2005 Ultimate Tournament of Champions Nifty Nine (players with byes into Round 2), Elite Eighteen (Round 2 winners) and Sweet Six (Round 3 winners) member: $105,199. 2002 Million Dollar Masters tournament quarterfinalist: $10,000. 1993 10th Anniversary Tournament champion: $41,800. 1990 Tournament of Champions semifinalist: $5,000. Season 6 5-time champion: $102,597 (winnings capped at $75,000 per the rules of the show at the time; $27,597 donated to Frank's selected charity, the Missionaries of Charity in New York City, an order of nuns that runs a hospice in Manhattan, a branch of the Calcutta mission administered at the time by Mother Teresa). Frank held the record for cash winnings in regular games ($102,597) from January 1990 to April 2003, when overtaken by Brian Weikle with the advantage of doubled dollar amounts. 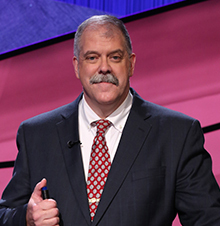 In his fifth game (#1241, aired 1990-01-15), Frank set a single-day cash winnings record of $30,600, breaking the previous record of $27,800 set by Kevin Frear (#902, aired 1988-07-05) and tied by Bob Blake in his second game (#1149, aired 1989-09-07). Frank's record lasted for over two years, when it was broken by Jerome Vered's $34,000 finish in show #1794, aired 1992-05-21. Frank appeared on Grand Slam on 2007-08-12. He was defeated and eliminated from the tournament in the Sweet 16 round by Twenty-One 6-time champion David Legler. #6769, aired 2014-02-06 Phoebe Juel vs. Mark Lowenthal vs. Frank Spangenberg Battle of the Decades: The 1980s game 4.